Coloured Sublimation Mugs are a quirky & unique item to personalise with Sublimation Printing or Laser Printing & White Toner Laser Printers from OKI. Fluorescent Mugs stand out from the crowd & look great when sublimated with bold dark graphics or when printed with white toner laser printing systems. 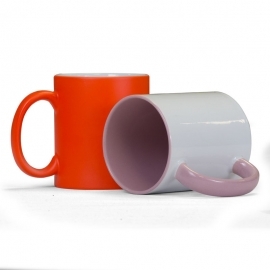 Mugs with coloured inner & handle sublimate like a normal white mug but with an extra twist.